A full length portrait of a young man in a homestead holding a spear and with hair plastered with ash. The film sequence shows that this is a man of Yakwach camp which Evans-Pritchard revisited in 1935, and that he and others were taking part in an evening dance. Note on print reverse ms pencil - "64 3 A151" & print front border ms ink - "NUER VI/88"
Morton, Chris. 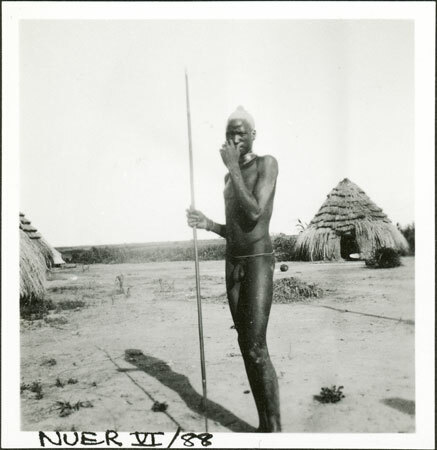 "A Nuer dancer" Southern Sudan Project (in development). 03 Jan. 2006. Pitt Rivers Museum. <http://southernsudan.prm.ox.ac.uk/details/1998.355.291.2/>.